DICE Target Scan proves compliance to FADGI** guidelines. The scan of this DICE target was done on a Bookeye®4 scanner, using the firmware level 6.70 and higher. 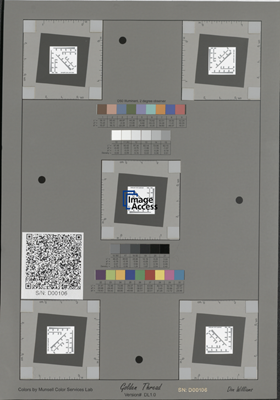 The FADGI template was selected and a white reference calibration was performed with ScanWizard, according to the FADGI guidelines. The document Quality Controlled Scanning describes all details of the calibration process and also provides extensive background information about FADGI, ISO 19264 and METAMORFOZE. According to the guidelines, the scan was performed only at 300dpi and with a slightly blurry setting, since otherwise it would be judged as being too crisp if the standard setting were used.